I came across this very affordable brand, CeraVe, online quite a while back. It was one of those USA “drugstore” brands that I pine for halfway across the world, because everyone raves about it especially for sensitive skin, but I can’t get hold of it for so many reasons. But when I found it out was available here in Malaysia, I was off to the pharmacies like Speedy Gonzales! You couldn’t see me for the dust I left behind! Unhappily, we appear to only have a tiny little selection available here in Malaysia, but hey, at least we get it! UPDATE: Cerave is as of 2017, no longer available in Malaysia. I’ve set out below where else you can buy it. 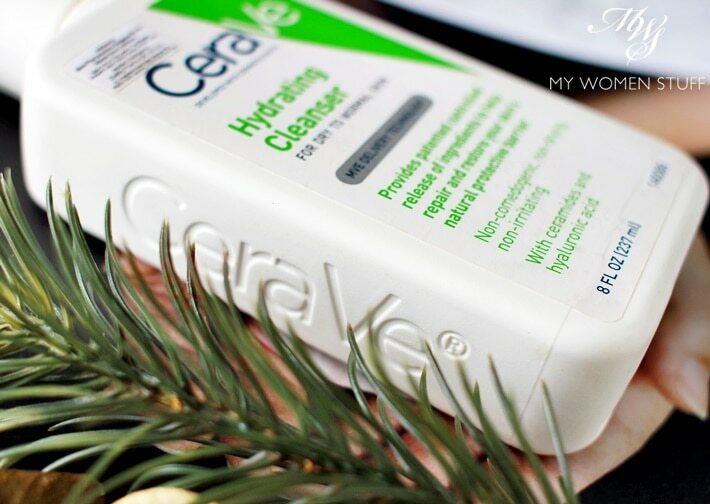 I picked up the CeraVe Hydrating Cleanser, targeted at dry to normal skin. Oh hey, that’s me! CeraVe (I have no idea how to pronounce it, so I call it ‘sera-vee’ in my head – let me know if you know!) is one of those dermatological brands, that remind me of Cetaphil. In fact, at the local pharmacy, it’s located near Cetaphil, Seba-med etc in the most obscure shelf you can find by the bath products, on the lowest shelf. You’d have to stoop down and really PEER at the shelves to be sure you can see anything, and then you’d be rewarded by the sight of 3 items. LOL! I kid you not! There were just 3 items from this brand on the shelf of the pharmacy I went to (Caring) and 2 items from each product. It’s like sifting sand for gold dust. 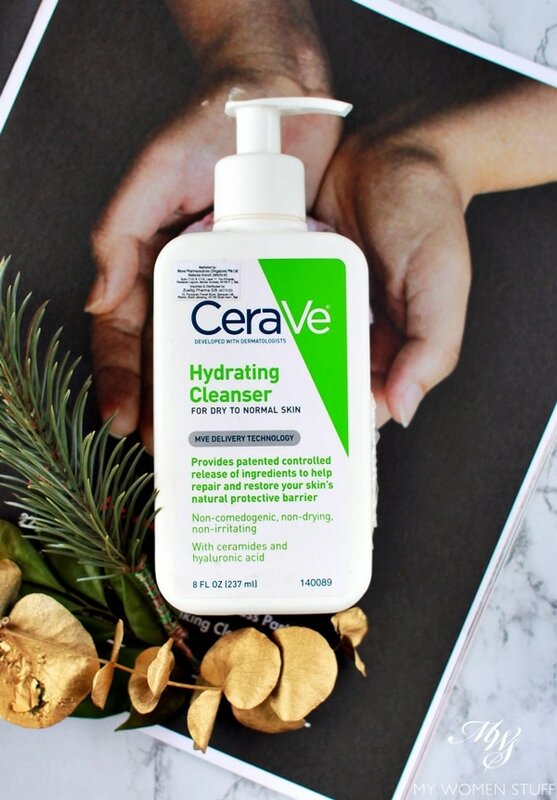 The CeraVe Hydrating Cleanser (bright green label) is formulated for those with normal to dry skin. If you are reading this and thinking “Darn! I have oily skin! Boo!” There is also a CeraVe Foaming Facial Cleanser (light green label) that is just as highly rated so you might be more interested in that one instead. What makes the CeraVe Hydrating Cleanser so awesome for dry skin is this – it doesn’t strip the skin while cleansing, and it feels gentle while it cleanses. The ingredients are supposed to be very beneficial, and mimics the skin barrier so it doesn’t strip the oils from your skin. This makes it also very good for those with sensitive skin, whose skin may get red and irritated by the slightest rubbing or harsh ingredients. I don’t have sensitive skin so I can’t tell you if it’ll be good for that, but it does feel gentle on my skin. This is how the product looks when you pump it out of the bottle. It is opaque and it isn’t creamy the way cream cleansers are. It has a slight translucency around the edges, and it reminds me of starch after it’s been cooked. It also does not foam up, and it doesn’t quite feel like a cream cleanser either. It applies on skin rather like a lotion, as opposed to a cleansing product. However, it washes off easily with just water, leaving a bit of a residue behind on skin. Your skin will not feel squeaky clean (it should NEVER feel squeaky clean, please!) but it doesn’t feel uncomfortable either. It just feels clean and hydrated, the way skin should feel. I use the CeraVe Hydrating Cleanser as my evening second cleanse, leaving it in my shower. I could also use it in the morning if I wanted, but despite the claims of it being gentle, I do find that if I double up on use, it actually does seem to strip my skin a little. So, I only keep it for use once a day, and pick it for the evening because I already have other cream cleansers I use in the morning. I won’t use this as a makeup remover, or as a first cleanse, because it quite frankly, is shite at the job 😛 Use a proper makeup remover or a cleansing balm or oil as your first cleanse, then use this as your second cleanse. The CeraVe Hydrating Cleanser is targeted at those with normal to dry skin. If you have oily skin you do not want this, you want the Foaming Facial Cleanser. The texture feels like a lotion, but it rinses off easily, without foaming up. It doesn’t leave my skin feeling dry unless I use it twice a day, in which case it does after a few days. I use this as a second cleanse. You could use it in the morning if you prefer. I just prefer using something else. It’s useless at removing makeup so use a proper cleansing balm or cleansing oil for that purpose. This isn’t meant for that. All in all, a very affordable and effective product. WHERE TO BUY: Caring pharmacy (I got mine here) or some of the smaller, independent pharmacies. I did not see it in Watson’s or Guardian. Buy it online at iHerb (use the code MPW213 for a discount) It isn’t much more expensive online and if you buy other items marked “Shipping Saver” you save a significant amount on shipping. 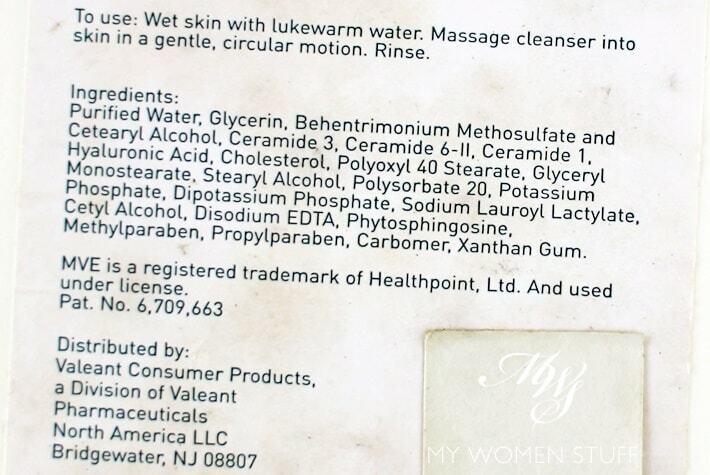 If you’re interested, here is the ingredient list for the CeraVe Hydrating Cleanser. Have you tried this cleanser or any products by CeraVe? I bought a night cream off iHerb because it was highly rated, and very affordable, so that’s my next foray into the brand. I do think this cleanser is very good especially if the air is making your skin dry, or if you have dry skin. You will naturally apply your serums and creams over this, but it helps to not walk out of the shower with a rictus grin on your face, because your skin feels so tight and dehydrated 😛 I like this one and my wallet does too! I think this might be a dupe for Avene gentle cleanser for combination skin the one with peachy color cream,non foaming and same texture to cerave. I have oily combination skin and I love the avene one as my morning cleanser,I might give this one a try next time as this one is way cheaper. Haven’t tried the Avene cleanser, but hey, this one’s affordable enough to have a go and see if you like it! I think they sell a smaller bottle as well if you don’t want to commit to this size 😀 There is another foaming cleanser as well by Cerave that many people love! I’ve tried the Cetaphil Gentle Skin Cleanser – very much overrated. It’s okay, just nothing to get excited about, IMHO. Btw, Caroline Hirons and Beautypedia gave pretty bad reviews as well. Have you tried the Oskia Renaissance Cleansing Gel? Fantastic. I did read about the bad reviews on Cetaphil cleansers! Maybe that’s why I wasn’t too keen to have a go haha! That said, I know of many people who find it helpful for their skin so perhaps it’s a case of mileage will vary. And you could be right about the mother brand and how it relates to why dematologists recommend it. When I was in hospital, and had these weird hard, dry skin on my hands, the doctor prescribed me cetaphil moisturising cream. I can’t say it’s bad because it did seem to alleviate the tightness in my hands, and on my skin although I was very wary about bringing it near my face – it just was a little too thick for my liking! I haven’t tried Oskia, but it’s one of those I have on my radar. Not sure if I’ll try the gel since I’m not into cleansing gels, but if they have a cream cleanser I’d probably have a go! I bought this at Caring after I saw Angie of Hot and Flashy use it for her day time (?) routine. I must say, after years of spending too much on products, this was a welcome change; good ingredients in solid and economical packaging. I am interested in the serum because the list of ingredient looks like they would do something, but wish me luck hunting them down. So far I’ve checked out Caring BV and Caring Avenue K. Nothing at Watsons nor Guardian. I’ve also checked out Boots next door, NADA. So online it is, I suppose. PARIS, I had a helluva breakout using Laneige Sleeping pack (twice!) and I can vouch you that this is my lifesaver! Bought together with the moisturizer and never regret any of it. I’ve tried Sothys (good as well but harsh on my thin wallet), Physiogel (so much similar to Sothys – even the scent!) and my oh my…. CERA VE winsssssss all the time! It is also selling in AA pharmacy in Bangsar, quite a few ringgit cheaper as well, i went there earlier this year. I recently picked this up too and although I have somewhat oily skin, it tends to be more on the dehydrated side. And I have sensitive skin. Anyhoo the cleanser is not bad for its price. I think Cerave is much better than Cetaphil for me as I find the latter to be rather clogging. It’s funny how I have been told by many how wonderful cetaphil cleansers are especially for their sensitive skin and then I’m now being told that it isn’t really that great LOL It’s interesting how viewpoints change over time. Hey PB! I have tried the Cerave Moisturizing Lotion but my aged skin quickly got bored of it and demanded I get something more moisturizing. I found the Moisturizing Cream which delivers enough moisture to keep everyone happy! I stumbled upon these at M+ Pharmacy and Natural Remedies at the lower ground of the old Bangsar Village. This pharmacy is a treasure trove of great items you don’t see elsewhere. This is where I get my Bioderma too and the natural remedies part of this pharmacy is pretty interesting. Hi! came across your post regarding Cerave cleanser. Great post btw, very helpful!!!!! Regarding the Caring pharmacy you went to, is it possible for you to tell where is it? I’ve been to several Caring but I cant seem to locaye Cerave products. Thank you! I think it was at Caring Publika or perhaps at Mid Valley. It’s hard to find at the range is very small and hidden. Look in the lower shelves near the “sensitive skin” products like Cetaphil, Seba-med etc. Hi I’m afraid I won’t know. Try contacting the manufacturer or brand directly to find out – they should be able to tell you. Do you know where to find this cleanser apart from Caring Pharmacy? I’ve been using this cleanser for 10 months or so and when I go back to Caring to rebuy it, sadly they said that Caring has discontinued their distribution of Cerave. I was very, very sad because I finally found the cleanser that happily suits my skin and doesn’t strip it off and also very cheap. I’ve tried looking for it online but the prices are way too expensive compared to Caring. Or do you have any suggestion for other cleansers that are similar to Cerave in terms of ingredients and price? Hi it appears that Cerave is no longer available in Malaysia, last I checked. You can however, get it from Iherb (https://my.iherb.com/c/cerave?rcode=MPW213) where the code MPW213 will get you between 5-10% discount 🙂 I buy mine from there now.